One of the best games of the season ended with the Bulldogs on top. Before Monday night, 103 Rose Bowl games had produced a total of zero overtimes. Then along came Baker Mayfield, Sony Michel, Roquan Smith and an Oklahoma-Georgia showdown we’ll remember for a long time. After a tense, back and forth game, Georgia emerged with a 54-48 victory Monday. The final blow came in double-overtime, when Bulldogs running back Sony Michel’s dashed 27 yards through Sooners territory for his fourth touchdown of the day. Until the overtime periods, this game was all about offense. Oklahoma charged out to a 31-17 first-half lead, thanks in part to a remarkable double-reverse pass play that ended with Mayfield catching a touchdown. The next 17 minutes or so of game-time, however, were all about Georgia as the Bulldogs ran off three straight touchdowns to grab a 38-31 lead. 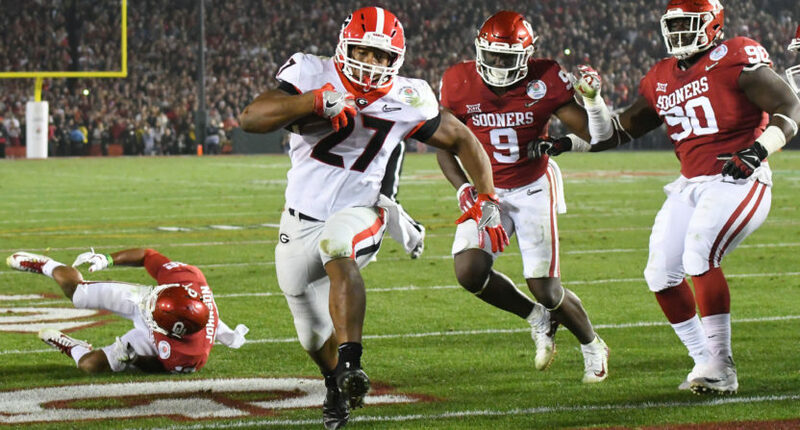 All evening, Georgia running backs Nick Chubb and Michel tore through the Oklahoma defense, leading the Bulldogs’ second-half charge and finishing with 326 rushing yards and five touchdowns on only 25 carries. But the Sooners responded promptly, with Mayfield leading a six-play, 88-yard touchdown drive to tie the game at 38. One fumble-return touchdown later, Oklahoma had a lead once again. After the teams traded punts, Georgia freshman quarterback Jake Fromm converted a key third down to set up Chubb for a score that once again knotted the game. The Bulldogs stopped Mayfield, and the teams headed for overtime. Oddly, the two extra periods were dominated by defense, with both teams settling for field goals in the first extra period and the Sooners having their attempt blocked in the second, before Michel’s final score. Arguably the most important player down the stretch was Roquan Smith, the Georgia linebacker who made one explosive stop after another. The Bulldogs’ win, in the highest-scoring Rose Bowl ever, gives them a chance at their first national title since 1980, which they’ll compete for next week against the winner of Alabama-Clemson. For Oklahoma, the loss marks a truly devastating finish to an excellent season, as well as the end of Mayfield’s decorated college career. Other than Georgia, the big winners Monday night were college football fans, who were treated to a second consecutive thrilling Rose Bowl and probably the most exciting semifinal in the brief history of the College Football Playoff. With a title-game berth on the line, these two teams both delivered championship-caliber performances. Sports just don’t get much better than what we saw in Pasadena.